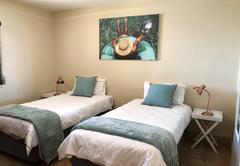 Loddey's Self Catering Apartment Five is a property providing self catering in Strand for up to 4 guests visiting the Cape Helderberg region. 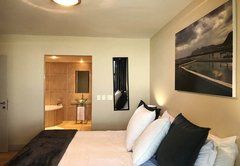 Loddey's Self Catering Holiday Apartment number Five is a stylish, sea facing apartment (sleeps four guests in two bedrooms) situated in the Ocean View apartment complex in Strand. 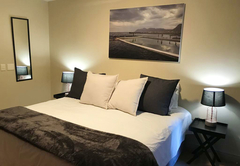 Here you are near to many attractions and activities in the area. 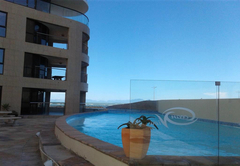 Loddey's Self Catering Apartment Five enjoys fabulous sea views and is elegantly furnished. 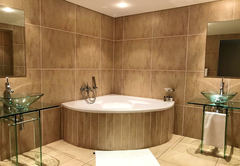 There are two bedrooms; the main bedroom is furnished with a King-size bed and has a full en-suite bathroom. 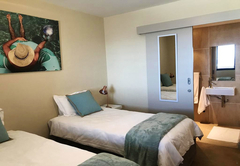 The second bedroom has twin single beds and an en-suite bathroom with a shower. 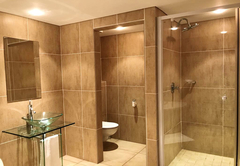 A separate guest toilet is available. The kitchen is equipped with a fridge / freezer, stove, oven, microwave, kettle, toaster, dishwasher, washing machine and a tumble dryer. 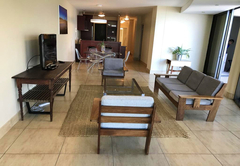 The living area is comfortably furnished and includes DStv. 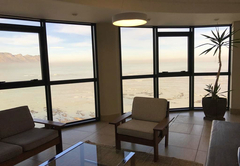 This room opens onto a balcony with views of the sea. 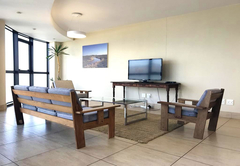 The complex has a swimming pool, braai facilities, good security and offers secure parking for our guests. 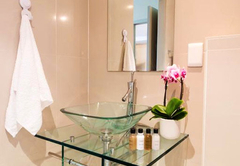 Response timeLoddey's Self Catering Apartment Five typically responds to requests in 5-10 minutes.